We are so excited to introduce Luli Bunny, a brand new line of stamps illustrated by Luli Bunny herself exclusively for Mama Elephant. Luli Bunny is an established artist that has worked with many great companies all over the world. She has illustrated for stationery, children's books, toys, games, bedding, patterns... and now clear stamps! You will love, love, love all the amazing kawaii characters and all the playfulness they exude. They are so fun, so cheerful, so happy! For my card, I used our Grassy Trio die as the ground to start off. Before pasting it onto the card base, I blended some Rainwater ink to create a soft sky. They blend so smoothly, you've got to try it! I stamped, die cut, and colored all the other elements separately and it was just easy peasy putting together this cute little scene. 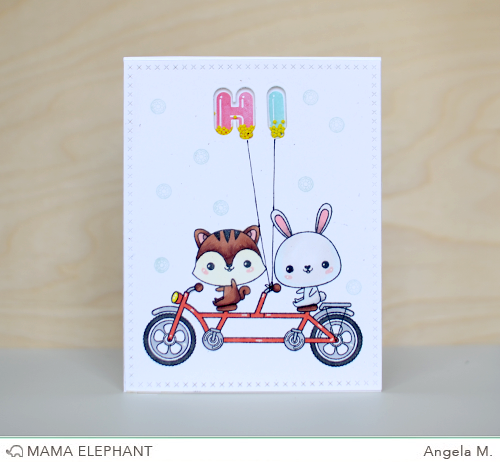 Angela created a shaker card by using the Balloon Letters Stamp Set and Creative Cuts in this card. She then stamped the animals on the tandem bicycle for this joyful scene. Thanks for joining us today, come back tomorrow for another First Look! 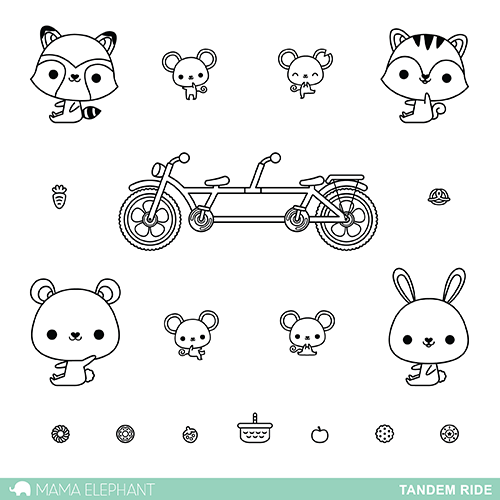 fabulous set,i have a friend with a tandem, she would love this , her last name is fox and the little raccoon could just be transformed into a fox ;-)..
Oh my this is just too cute!!!! Absolutely adorable, what fun cards. So stinkin cute!!! Great release. Riding the bike is a fun move. So cute! We had a bike like that when I was younger. Wasn't much fun. My sister would sit behind and make me do all the work.. hehe Thanks for sharing. What an adorable stamp set! Love your cute samples too! Love these little characters!!! Too cute! OMG...So sweet and cute!! I must have this stamps set! Love these new fun critters. Another irresistible set!! Love Kryssi's and Angela's cards. This new set is so cute. They remind me of my friends. Oh those critters! So cute!